One of my personal favorite tricks is the “hug”. I like it because it really feels like a hug, and it also seems like Tucker understands that I enjoy it more than just as a trick. It is something that seems to make him happy as a way of expressing affection in a language we both understand, along with "kiss." Before I explain how I teach this trick, here's a cute story that also might help you understand the safety risks associated with hugging. One winter break during college when Tucker and I returned home, there was a little girl about 7 years old that followed me everywhere. She helped me with chores around the ranch I did in return for Tucker's board, and absolutely adored Tucker (as do most little girls who meet him). I was doing something at the barn one day while Tucker was out in the pasture with his band of mares, when I noticed the girl in the pasture. I didn't exactly have authority over the little girl, but generally we do not allow young kids in pastures alone with groups of horses for obvious reasons. I was about to head over when she did something so interesting I stopped to observe. She had a drink in one hand, but walked straight towards Tucker's side and hugged him. He hugged her back. She hugged him again and again, and each time he hugged her a little tighter, careful not to step on her or knock over her drink. I was worried he would accidentally step on her of course, or that another horse would come over and cause mayhem and step on her. This did not happen and by the time I was approaching the fence the girl was already exiting. He literally hugged her until she was hugged out and left! He received no treats for this act, and afterwards just returned to grazing. I was amazed. Tucker often hugs or kisses me without expecting rewards, and with such affection it is hard to think he doesn't understand that this is how we weirdo humans display love. You can use either a treat lure or a target to teach this trick, and you may stand facing towards or facing away from the horse. Things will be quicker if you can achieve the desired result while facing towards you horse! If using a treat lure, you'll need to show them the treat is in your hand. If facing your horse, put your hand behind your back and show them the treat. Then slowly draw their head behind you while you stand in "hugging position" and reward when they make the stretch (by the way, this is a good way of getting them to stretch!). Once they start to get the hang of it, you can withhold the reward until after they hug and you return to normal position. If using a target, you can do the same type of thing except you will hold the target behind you and reward the horse for every time they touch the target. Gradually have them reach farther and farther for the target. I recommend using a target if you have a particularly bitey horse! The cue I use for this trick is simply my body approaching Tucker for a hug. 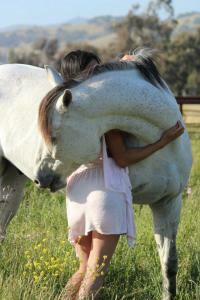 This is problematic if your horse is super pushy, as they can grab you into an embrace when you're least expecting it! You can reinforce the cue by holding your hand behind your back if they don't pick it up right away, and transfer the cue from the hand behind your back to you reaching around their neck. Very amazing and helpful text! I really enjoyed reading it!